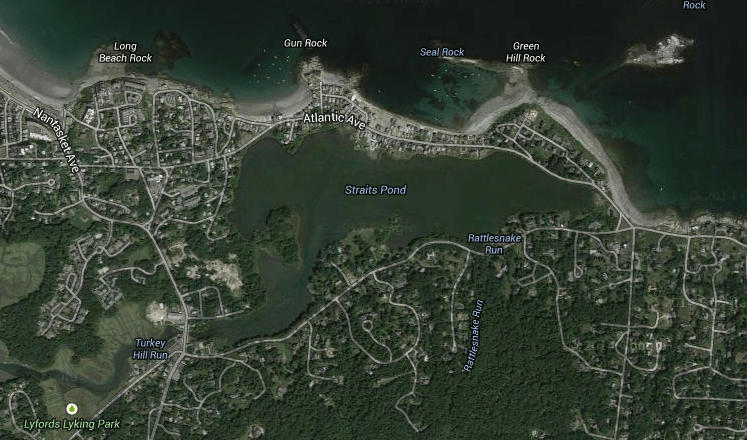 Cohasset, Hingham & Hull working together to maintain & improve the environmental quality of Straits Pond. Straits Pond and the Weir River are designated an Area of Critical Environmental Concern (ACEC) with class SB standards. The SB designation means there are strict standards of protection: no degradation of water quality allowed under the law. Class SB are marine or coastal waters designated for the protection of fish, other aquatic life, and wildlife; for primary and secondary contact recreation; and shellfish harvesting without depuration in approved areas (EEOA Office, Final ACEC Guidance Document, 1/92). SIZE: approximately 92 acres of salt pond (1980 survey 91.4 acres). DEPTH: approximately 1–1.5 meters. The depth varies with the tides and seasons and is controlled by a tidal gate at the west end (West Corner) of the pond. FLUSHING TIME: is defined as the time it takes one pond volume of water to discharge from the pond. In 1980, the flushing time was figured as 71 days because the Pond area is large relative to the watershed area. Note: It is easier to get water out of the Pond than to refill it as water drains out of the gate at low tide, but typically it takes several high tides to replace the water.